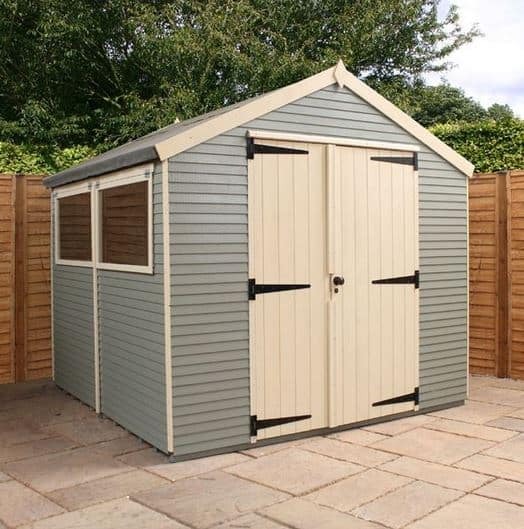 Whether you’re looking for a workshop, hobby shed or general storage building, this Ultimate Shed by Mercia could be just what you need. With an exceptionally spacious design, it is built with very thick 16mm Shiplap Plus tongue and groove cladding. Even the roof and floor benefits from the same thick tongue and groove cladding construction. This makes the building suitable for holding heavy furniture, machinery and equipment. There are two large, single glazed windows included, offering natural lighting, as well as noise reduction and they also open up to let air into the shed. Even the doors benefit from a high quality, durable and stylish design. Hung with black, antique design hinges, they benefit from a double braced construction for ultimate stability. A 10 year anti-rot warranty gives you great reassurance that the building will last for many years. It isn’t just the outside of the shed that is created to a high standard either. The framing is also impressive, guaranteeing you a stable, fully supported structure. Thanks to the extra tall eaves and the stylish Apex roof, you can also store taller equipment and tools, as well as enjoy a more comfortable experience. 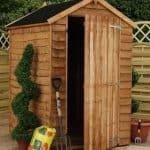 All in all this truly is an ‘Ultimate’ shed that is well worth the initial high price tag that comes with it. High initial cost, though it does provide excellent value in the long term. 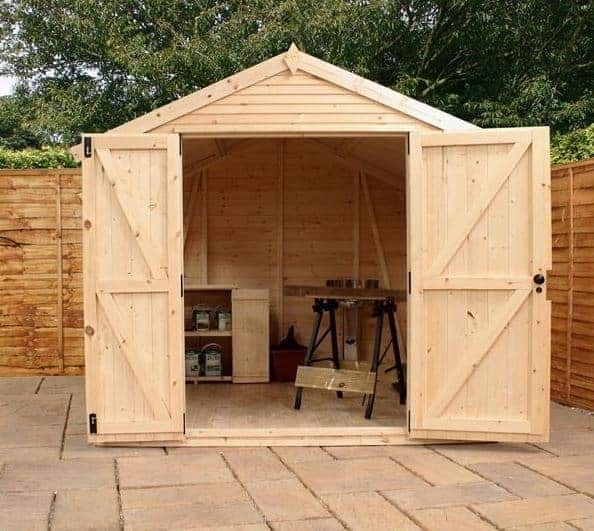 This thick, solid wooden storage shed has the potential to be used as a home office, hobby shed or workshop. The apex roof is covered with heavy duty mineral felt and offers a good amount of extra head space inside the building. It also has brilliant water-resistance, ensuring water drains down either side of the roof, straight to the floor. As this stops it from building up, there is very little chance of damp becoming a problem. This is partially why the manufacturer gives a 10 year anti-rot guarantee. Whilst the style of the roof isn’t uncommon, the fact that it is built with 16mm tongue and groove cladding is. You’ll find a lot of manufacturer cut costs on outdoor buildings by using solid sheet materials for the roof and floor. These materials may provide adequate support, but the thick tongue and groove roof on this model really adds to its durability. As mentioned, the apex roof gives the shed a lot of extra height. The roof measures 2.31m and the eaves reach 1.72m. The building also measures 2.57m wide and 4.26m deep. The double doors also come with a much wider design than average, measuring 1.30m and 1.77m tall. So whatever you choose to transfer in and out of the building, you can be sure you have more than enough room for even the bulkiest of items. We’re big fans of the Mercia Ultimate Shed range, largely because they feature such impressive cladding. 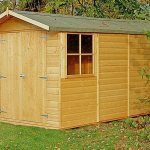 This top quality shed uses 16mm Shiplap tongue and groove. 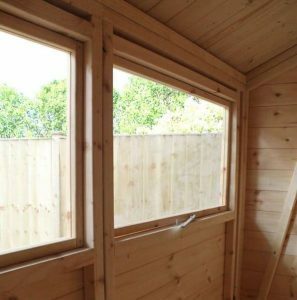 Whilst Shiplap is used on a lot of outdoor buildings, it does come in varying thicknesses. Most commonly you’ll find manufacturers stick to 12mm thick Shiplap. So with this building you benefit from a thicker and therefore more durable design. So what makes Shiplap so impressive? Firstly it has a stylish design. 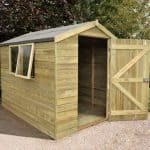 Obviously whilst practicality, quality and durability are the most important factors you should look for in a shed, you also want to make sure it looks good in the garden. Shiplap offers a smooth, stylish finish and the fact this model comes with a painted design also enhances its attractiveness. The second reason Shiplap is worth investing in over any other style of cladding, is because of its natural water resistant design. Look closely at the panels and you’ll see they have a slight groove. This is there to channel rainwater down onto the floor. So even the walls of the shed are built to withstand even the rainiest of days. Of course, you can’t forget the tongue and groove part of the shed’s design. The main benefit of tongue and groove style cladding is that it prepares for any changes in the timber. As the seasons change, heat and moisture can cause the wood to warp. Tongue and groove cladding leaves a small expansion gap which has room in case the timber does expand. What this ultimately means is that the structure won’t become damaged or weaken because of these seasonal changes. The framing on this Mercia Ultimate Shed is impeccable. What you’ll tend to discover is that garden sheds often come with 28mm x 28mm framing. It’s a standard thickness that seems to provide an excellent level of stability. However, sheds that feature this type of framing also usually come with 12mm cladding. As this one comes with incredible 16mm cladding, the company has made sure to also increase the thickness of the frame. It is almost double the standard thickness at 44mm x 44mm. It isn’t just the thickness that’s profound either. The framing also benefits from a planed and rounded design. This makes it more stylish, moisture resistant and safer due to the decreased risk of splinters. Finally, the floor also benefits from the same tough 16mm tongue and groove cladding. This makes it suitable for heavy equipment and gardening machinery such as lawnmowers. This shed may be constructed with thick, superior quality cladding, but unfortunately it still needs to be treated. Compared to standard tongue and groove and overlap clad buildings, this one does have a longer-lasting natural protection against the elements. However, without treatment it will start to deteriorate over time. Now as it is created with the highest quality type of cladding on the market, you can get away with using a water based treatment. They protect the surface of the timber and form a very effective barrier against the elements. They are also often designed with quick drying, fade resistant, odour free benefits. However, this will depend entirely upon which brand you choose. They are also available in a wide choice of colours. However, as the Ultimate Shed already comes with a painted finish we recommend against choosing a different coloured treatment. Be aware that if you do choose a water based treatment, it will need to be re-applied once each year. The other treatment type available and the one we recommend, is a spirit treatment. This doesn’t just protect the building’s surface, it also penetrates into the wood and forms a highly effective interior moisture resistant barrier too. 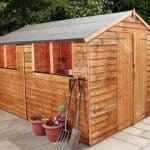 Due to the cladding quality of the building, you may be able to get away with treating the shed less frequently than you would with a water treatment. However, it’s advised that you follow the instructions provided by the treatment manufacturer. As long as you follow the treatment instructions, you will benefit from a 10 year anti-rot warranty. Before mentioning one of our favourite parts of this shed, let’s talk about the windows. There are two, large rectangular windows supplied with the shed and they come with thick single glazing. You’ll find there are different thicknesses of glazing available, with most single glazed windows on outdoor buildings measuring 4mm thick. This one however benefits from 6mm thick glazing. So it offers more insulation and noise reduction than many of its competitors. This isn’t the only advantage of these windows either. You also have the choice to build the shed with the windows on either side. Then there’s the added benefit that they can be opened and closed. 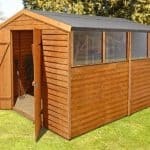 This supplies excellent ventilation into the shed which is especially welcoming in hot weather. Now the doors are one of our favourite features of this shed. Not only do they provide the more practical benefit of a spacious, hassle free entry point, but they also feature an incredibly stylish, antique design. This is thanks to both the black, striking antique hinges and the cream coloured painted finish, they contrast with the rest of the building, creating a very strong focal point. We’re sure you’ll love them just as much as we do. We aren’t surprised to see that this shed also benefits from a high level of security. A Rim lock helps to give you reassurance that only you will be able to get into the building. Then there’s the security benefits that come from the thick, superior cladding. Even with a crowbar thieves will find the shed difficult to break into. As the windows have a slightly thicker than average single glazing, they are also more difficult to break. So all in all this is a very secure building. Privacy is the only thing you might be disappointed with. As both windows are quite large, it’s pretty easy for anyone to peer inside and see what you are keeping in there. So you have two options here. You can either cover up anything of value or you can invest in curtains or blinds. The cladding will easily support the weight of a curtain pole for example and it won’t be very expensive to add blinds or curtains if you want to either. You’ll notice there is a very limited choice of customisation options and extras. This is actually a sign that you are buying a high quality building that requires very little improvement. The first extra that will likely stand out is the electrical pack. It contains a strip light, double socket, light switch, mains input socket and RCD unit. Not everyone will need this, but you will if you’re hoping to use the building as a workshop. The pack will supply lighting and power for electrical tools and equipment. Just be aware that once installed it will incur long term running costs. The weatherproof padlock is something you might want to consider. It comes in a very tough Thermoplastic weatherproof jacket and features a brass cylinder, double locking and a protective cover over the keyhole. The shed does come with a Rim lock, but this would further enhance its security which can only be a good thing. It also comes with a hasp and staple. The only other extras on offer are numerous treatments and Draper accessories. Draper is a leading brand of DIY tools and equipment. The two accessories available here include a 14.4V Cordless Rotary Drill and a 2 Piece Spirit Level Set. 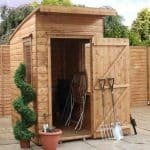 Obviously these can come in useful, but they aren’t something you necessarily need; particularly if you’re just using the shed as a storage facility. After reading the review it’s no surprise we’ve given this a 10/10 quality rating. There’s nothing we can fault about the design of this shed. From its overall appearance to the quality of the cladding – it truly is a remarkable storage facility. If it wasn’t for the treatments needed to maintain the shed’s weatherproof benefits, we’d have given this another 10/10 rating. It’s a very rigid, long lasting building and if you use a spirit treatment you may not even have to treat it every year. As well as its exceptionally spacious floor space, this large shed also offers you the opportunity to install shelving units. The amount of space offered means you can practically store anything you need to. Installation is simple considering the size of the shed and the fact it has windows and heavy, large double doors. The main consideration you need to make is that it will take quite a long time to assemble. It’s also a heavy job so you shouldn’t attempt to do it alone. It’s recommend at least 2 people are involved. The value for money offered from this shed far outweighs the high cost. Its quality, style and space benefits are just some of the features that give it such exceptional value. Final Thoughts: This is one of the larger models in the Mercia Ultimate Shed collection. Benefitting from a wide range of impressive features, it is by far one of the best sheds we’ve reviewed. Every single part of the building has been designed to the highest standards. We love the 16mm Shiplap Plus tongue and groove construction. Unlike a lot of buildings, this tongue and groove construction is extended through to the floor and roof. So you are left with an outstanding, strong structure that is capable of being used for a number of purposes. The antique style hinges and painted design are a particularly notable feature. 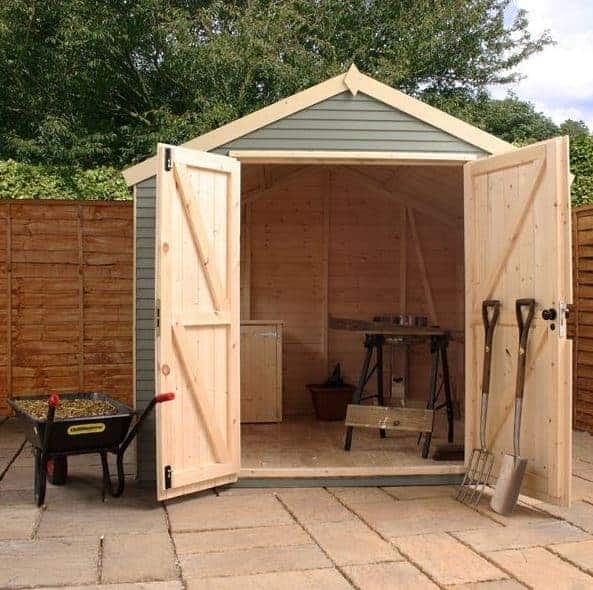 If you’re looking for a shed that oozes style as well as practicality, this could definitely be the right one for you.